And those claiming that they r eating their tax payer money, i dare them to spend one day in active line of such duty & ill pay them their one month salary and I know they don't have balls to even stand up that much tough routines. 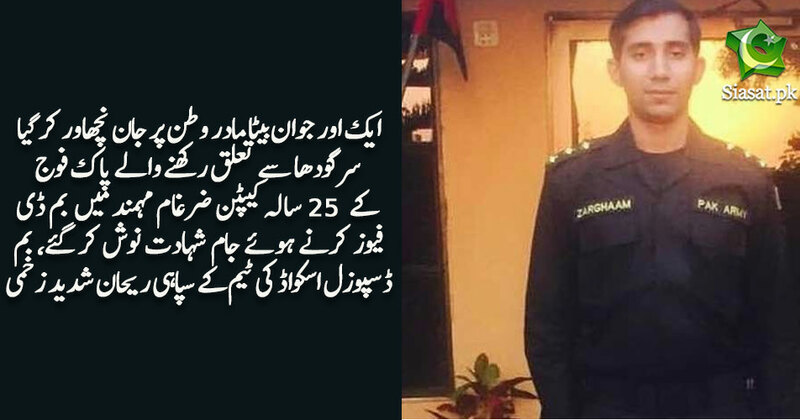 Salute to the Martyr, you have secured our children future with your holy blood. All the angels are welcoming you on the doors of Heaven. Where Are Bhaibarood and KingQ And Zaidi Qasim And All The Other Randian Rats That Infest Siasat.pk?????? Let Langra Khadim Rizvi, Jalali and the so called pro-democracy lovers go for only one day, just a single day to the frontline against terrorists . Then if they start issues fatwas we will think over it. My deep felt prayers are with the 'Shaheed's family and friends. It is brave sons of the soil like them that were are safe in our houses. Samlee randian hogee teri ami. allah iss kay ghar waloo ko sabr day ameen. Why can't we buy robots to diffuse such devices which is very common in west? For me it looks like we don't care about if someone loosing a life or not. Robots are expensive and humans are cheap and readily available. Those cowardly baastards are hiding. Zaidi Qasim the haraami is being pumped by his favourite animal. Can we rank their haraaminess- although there is a couple on that list that should not be on there.